After the Taiwan Expedition of 1874 by the Japanese (also referred to as the Mudan Incident), Qing rulers changed their passive attitude and took a more ambitious approach in their rule of Taiwan. 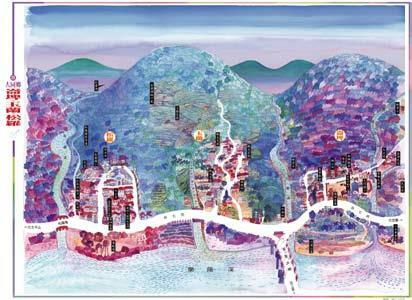 The original Kavalan District was renamed Yilan County, and the administrative system was also changed accordingly from that of a temporary "district" to a formally governed "county". The aboriginal term “Kavalan” was thus replaced by "Yilan", denoting a domesticated, Han-centric region. The policy of "opening the mountains and appeasing the aborigines" was concurrently undertaken, which entailed repairing three major roads including the modern day Su-Hua Highway so that natural resources in the mountains more readily accessible. When Liu Mingchuan was appointed Taiwan governor (1885-1891), base camps were set up in what was to be present-day Sanxing Street to act as frontlines in the process of "governing the aborigines". Liu fought battles against the Nan'ao branch of the Atayal tribe with limited success. Before the Flag of the Yellow Dragon gave way to the Flag of the Rising Sun, the Han living in Yilan were mainly limited to the plains.